Ages 9 through 17. 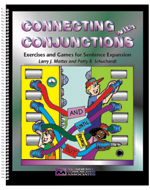 This book, published by Academic Communication Associates, includes games and activities designed to help students use conjunctions more effectively. The activities require the student to identify the appropriate and inappropriate use of conjunctions, to combine sentences, to add descriptive information, and to create stories in which conjunctions are used. Activities for coordinating conjunctions, correlative conjunctions, and subordinating conjunctions are included.